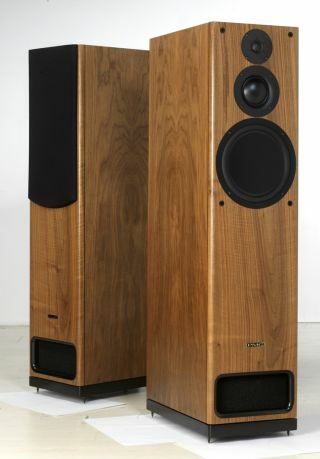 Back in January, we brought you details of a whole new range of PMC loudspeakers, called the I Series. Well the line-up has just grown by one, with the announcement that the ‘prosumer’ speaker specialist is adding a high-end, heavyweight to its largely affordable I Series products. Enter the EB1i – a “radically improved” version of the original EB1 – PMC’s hefty three-way floorstander. In keeping with its ‘I’d-up siblings, the new EB1i gains the new Solonex soft dome tweeter, which has been made in conjunction with Norwegian drive unit specialist SEAS. This key modification is said to give the £5,950 EB1i extended high frequency detail, greater power handling and a broader off-axis response. The speaker’s cabinet has also been improved – there’s more sophisticated jointing throughout and ‘Cabinet talk’ has been reduced further against the original model. A new high-gloss lacquer ‘seals’ the deal.